Private supporters donated an environmentally-friendly Tesla Model-X to serve as the foundation of the project. The electric vehicle has been custom wrapped with 5,000 transparent water drops. Each drop represents a Central African Republic family who lacks safe and reliable water access—water poverty affects an estimated 667 million people around the world. For the next two years, PUC staff and students will be touring the United States in the Tesla, offering presentations on water poverty and accepting donations for “drops of water.” The team’s schedule is already filling with requests for assembly programs, class presentations, and workshops. Participants will have the opportunity to explore the Tesla too. 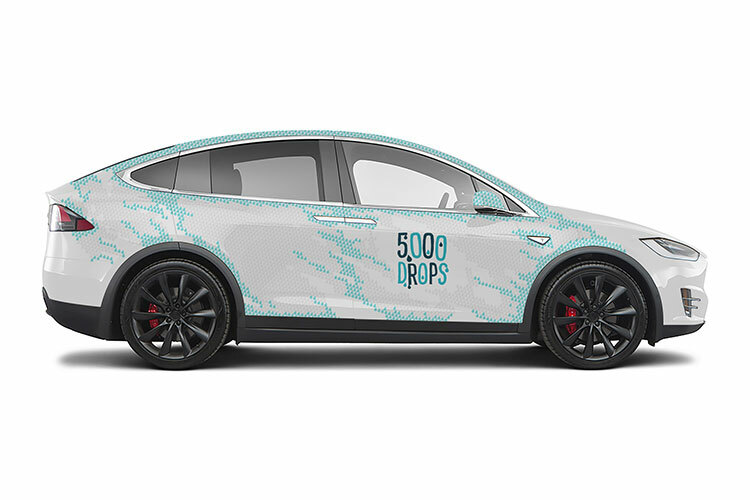 For a donation of $25, a donor receives a water drop shaped decal to place atop the transparent placeholders on the Tesla. On each drop, there is unique GPS location. Donors can go online to 5000drops.com, plug in the coordinates, and monitor the status of the wells their specific donation supports. As donations increase, the blue water drops will cover the Tesla. By the end, this campaign will have raised over $125,000 to provide 20,000 people with a year of clean water. “Ultimately, the goal is to improve lives in the Central Africa Republic and build more connections between young people and the impact they can make through their generosity,” says Maia. For more information about the 5,000 Drops project or to schedule a presentation for your organization, contact Fabio Maia at (707) 965-7190 or by email at fmaia@puc.edu. To follow the campaign progress or to make a tax-deductible contribution visit 5000drops.com.